The Green Revolution device snaps on to the front of all major brands of indoor cycling equipment. "We didn't want people to have to purchase new cycling equipment. So we've made it so it fits on to all major brands of cycling equipment," Whelan said. "A wire runs out from the bottom of each bike and connects to an electrical control cabinet." So far, Whelan has received positive feedback from gym members who have used the equipment, and with the help of an interactive carbon calculator people can measure how much energy they are generating from their workout. The output from a single workout is only enough to power a light bulb or a laptop for about an hour and saves between two to six ounces of CO2. But power generation starts to stack up as more people get in the saddle. Green Revolution estimate that a group of around 20 bikes used throughout a year has the potential to create 3,600 kilowatt hours of electricity. That, they say, equates to lighting 72 homes for a month. Whelan says that there are around 36,000 health clubs in the U.S. alone, so the potential is there for the equipment to make a worthwhile impact on carbon emissions. "If every club had one," he said, "then that would create a substantial amount of energy." 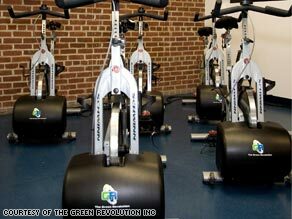 Green Revolution say that their technology can easily be attached to most other types of cardio equipment. So if pedal power isn't your thing, you can use a cross trainer or a step machine to burn away those calorie and carbon ounces. Along with health clubs, Whelan is hoping that the corporate and university markets will prove lucrative for the company. He says that orders are already starting to roll in from all parts of the United States. In 2009, Whelan plans to take his Green Revolution to the European market.